My stomach is smiling. 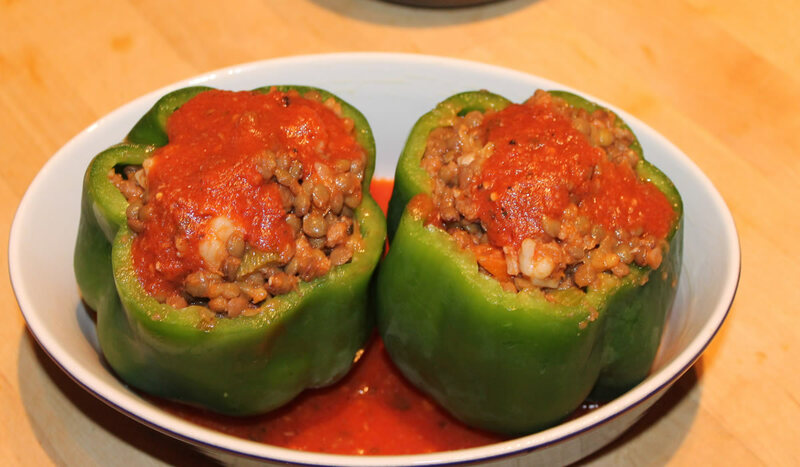 We just had stuffed peppers – stuffed with lentils and shrimp. Not only is my stomach smiling, I’m practically giddy! It was that good! I made lentils a couple of weeks ago and Victor mentioned that the concept would probably be good as the filling for stuffed peppers. Monday, I bought peppers and last night casually mentioned that stuffed peppers would make a great dinner, tonight. The boy knows how to take a hint. He also knows how to cook! I cooked up the lentils early – a lot of them, hoping there would be enough to stuff peppers and have as a side dish on another night. 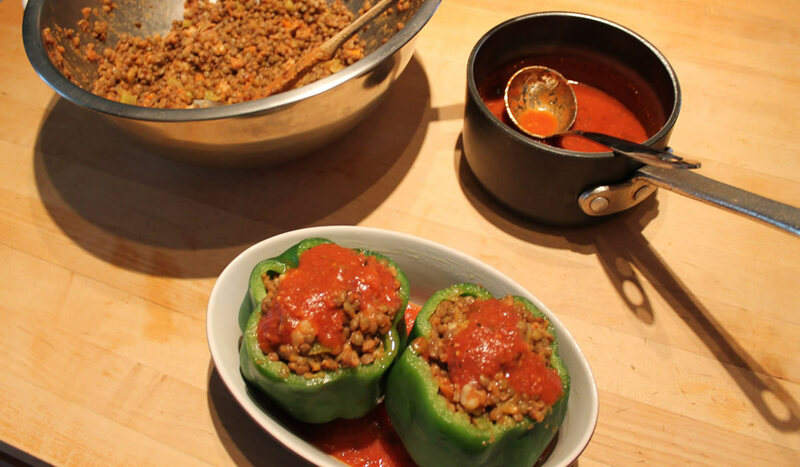 My wish was granted – perfectly stuffed peppers and enough lentils for a fun dinner, tomorrow. Sauté the carrots, celery, onion, and fennel in olive oil till soft. Add the minced garlic and anchovies. Add the crushed red pepper – pepperoncino. Add a splash of white wine and about a cup of chicken stock. Let the liquid reduce. Add lentils and off the heat add grated cheese (lots). If it’s too wet add some breadcrumbs. Place in a casserole and add a bit of good red sauce. Cover and bake in a 350°F oven for about an hour. At the 30 minute mark, remove the cover and sprinkle on some cheese. Continue baking until cooked through. They really came out good. The red sauce was tomato sauce we made back in August – he doctored it up with some garlic, oregano, red wine… a perfect accompaniment. We made 17 pints of simple tomato sauce – I wish we had made 117. It really beats the stuff out of a can. The recipe is meant to be played with – use what you have in the house and have fun with it! And then get your own giddy smile!